Boca Raton Road is the only remaining vestige of the Boca Raton historic downtown. It contains an eclectic collection of low density buildings that have fostered a thriving mix of innovative small businesses including the creative arts and boutique restaurants. 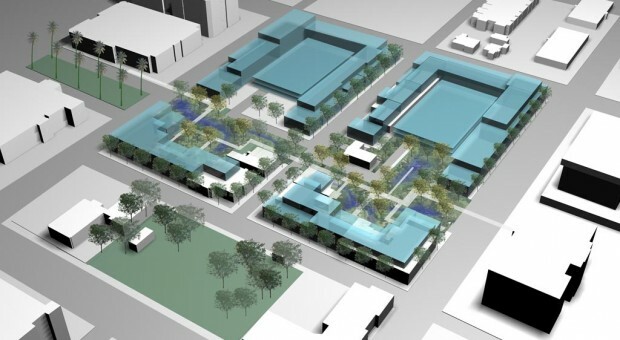 The Boca Raton Historical Society engaged Michael Singer Studio to explore planning opportunities as an alternative to a development scheme that was proposing to extend the Mizner Park development and connect it to commercial and residential towers to the south. The proposed new development followed a commonplace pattern of higher density and large commercial spaces targeting national level brands; rendering the proposed commercial spaces too large and costly for the existing businesses. With minimal time and resources the Singer Studio team conducted research, ran a workshop and generated a series of alternative development concepts for the Boca Raton Historical Society. The entire project had to be carried out in less than 2 weeks due to pending development approvals. The workshop provided an opportunity for citizens and stakeholders to understand and evaluate development options, and express their ideas about the site. Following the workshop Singer Studio provided three alternatives: high level development, mid density and lower density, each with a different balance of historic preservation. The schemes also noted various environmental, streetscape and massing strategies to demonstrate how any scheme regardless of density could be more considerate of the sense of place the historians sought to preserve. In addition to the alternative development schemes, the Studio emphasized to the community that the existing spaces and buildings already offered a flourishing small scale downtown and that the newer office developments proposed would be replicating the Mizner Park office space that was shown to be largely vacant at the time. A short report was presented to the Boca Raton City Council, the Community Redevelopment Authority and the public. The results helped the Historical Society gain a position in the City’s planning process and negotiations with the developers. In the end, there wasn’t clear demand for the programs and uses put forth in the new development plan and the project was put on an indefinite hold.